Absolutely thrilled to see one of my favorite clients, Holy White Hounds, making national waves today! Announcing their signing with Razor & Tie, they are now national recording artists, and I couldn't be happier for them or more proud of them. Way to go, babes - you all deserve it so so much. Can't wait until our next shoot. Thank you to Matthew Leimkuehler for featuring my press photos of the band in his second page article in the Des Moines Register in print and online. 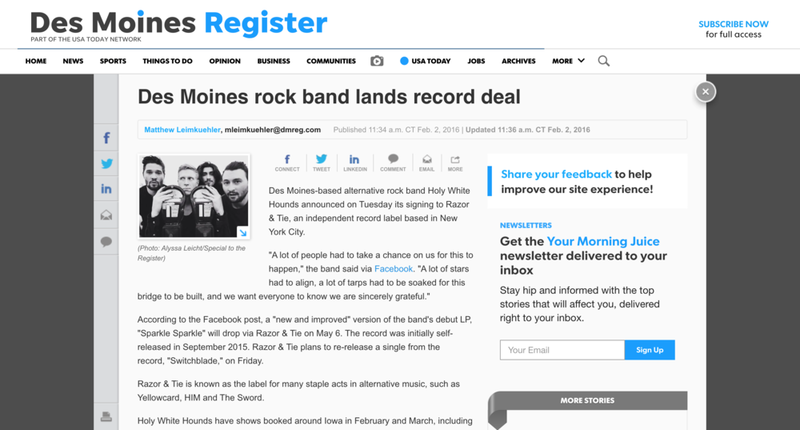 Lots of news coming out of Iowa today, but none we are more thrilled about than our signing of Holy White Hounds! Listen to their first single 'Switchblade' and look for their debut album Sparkle Sparkle to be released May 6.